Marver Bernstein, a native of Mankato, Minn., served as the fourth president Brandeis from 1972 to 1983 and, later, as a professor of politics and philosophy in Georgetown University's School of Foreign Service. He was a budget examiner for the federal government from 1942 to 1946, when he began his academic career at Princeton University. Bernstein taught for 25 years at Princeton, where he was the first dean of the Woodrow Wilson School of Public and International Affairs, from 1964 to 1969. 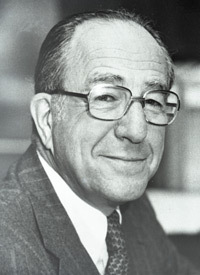 Bernstein earned bachelor and master's degrees at the University of Wisconsin, where he was elected to Phi Beta Kappa, and a doctorate at Princeton. Bernstein and his wife, Sheva, died tragically in a hotel fire outside Cairo, Egypt, in 1990. He was 71 years old.